Our week-long wellness retreats in Seminyak provide a luxurious experience that reset your system, inspiring healthier habits for a more balanced lifestyle. 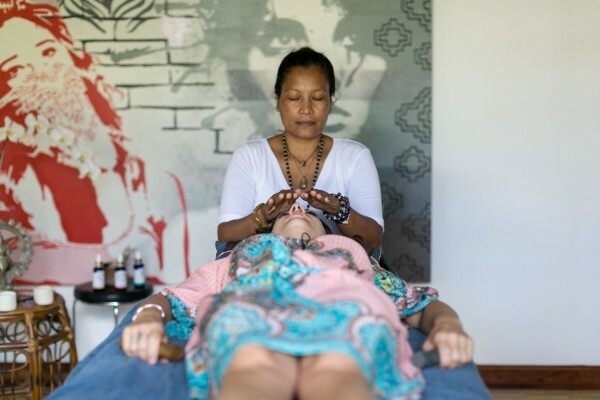 To give you the ultimate detox, at our Bali retreat for women, we provide every element you need to reset, reconnect, nourish and indulge from the inside out. You’ll centre yourself with personalised yoga and meditation sessions while deeply replenishing your body with locally sourced wholefoods. After a week of clean eating, holistic treatments and massages, quality time spent in nature and lots of sleep, you’ll leave our Bali retreat for women feeling refreshed on every level. Tucked away in lush tropical gardens, our retreat makes next-level nirvana seem totally achievable. Our Bali retreat for women is the perfect gateway getaway for getting healthy. Our sprawling, meticulously manicured property itself is designed to promote well-being from the moment you check in, with beautifully turned-out rooms and plenty of nooks for introspective thought. Gathering for shared meal times, workshops on wellness topics of interest, you’ll end up making new friends by the end of the first day. As we’ve come to understand it, wellness is “…a state of complete physical, mental and social well-being, and not merely the absence of disease or infirmity.” It is an active process of being mindful and making thoughtful choices toward a healthy and fulfilling life. With that understanding, you can look forward to reconnecting to the brightest version of yourself with our wellness retreat. An early wake-up, jumpstarts each day with us, rising with the sun is the best way to get your body in sync with its natural circadian rhythms. Break your fast and replenish your system with our finely tuned menu, designed by an expert nutritionist and naturopath. Our whole-foods approach to nutrition ensures you body is flooded with dense nutrients and resets your digestive system over the course of the seven-day retreat to make way for healthier eating habits. Our talented in-house team of chefs prepare all of our meals, turning out multiple courses of delicious food throughout the day. No matter the wellness program (pilates, surfing, yoga and wellness) you choose for your retreat package, a yoga practice session is integrated into your daily routine while with us. Throughout the week, we hold wellness-oriented workshops to discuss various topics spanning from nutrition to mindfulness, so you can carry on with your healthful routine at home. Spend the afternoon’s poolside and wind down with in-house treatments and wholesome meals shared with new friends as the sun sets. Our women’s wellness retreat is all about doing what feels right for your mind, body and soul, so no matter which program you choose, you’re sure to reap the benefits. Whether you join us on a girl’s getaway or on a solo trip, you’ll return home feeling totally refreshed and reinvigorated — with a new set of like-minded friends to top it all off. Learn new skills, reset your system and build a lasting connection with yourself—all while breathing deeply and laughing loudly. When you return home, you’ll take these exhilarating experiences and start afresh by bringing healthy new practices into your life. We are running three trips in 2019. Two explore Komodo National Park and depart from Bira, Sulawesi in May and from Bima, Sumbawa in August. Our third trip for the year is to Raja Ampat in November. Learn more here. You will experience a life-changing experience leaving you glowing from the inside out after a week of ‘me-time’ reconnecting to the best version of you. You will have seven days to reset any habits you wish to change. We are incredibly experienced at helping you facilitate the change. You will totally disconnect from your daily life. We curate an experience that enables you to switch off from having to make any decisions. This allows true peace of mind, and you’ll be wholly present. You will learn insightful knowledge from our wellness workshops, which will provide you with just what you need to implement long-lasting changes in your life. You will reset your digestive system. By detoxing, you will change your relationship with food. You will sleep more deeply, and your skin will look revitalized after seven days of nourishing wholefoods and no alcohol. You will experience personal growth and feel empowered after stepping outside of your comfort zone and participating in new activities. You will make new lasting friendships with other like-minded women after bonding over new experiences and warm conversations. You will gain a more positive outlook, which will influence every facet of your life. We guarantee that you will progress in your yoga, surfing and Pilates practice. You’ll also have a new lease on life after leaving our retreat feeling refreshed on every level. After all, taking a time out to invest in you is one of the greatest gifts you can give yourself. Our Bali women’s wellness retreat is a wonderfully rewarding experience. Set in a beautiful space created just for you, for some well needed ‘me’ time, to enable you to reset and connect with your mind, body and soul. Surrounded by dense tropical gardens, our retreat makes next level nirvana seem totally achievable. An early wake up call marks the beginning of your active days with us, which consist of yoga classes and your choice of Pilates, surf, holistic healing or yoga programs. Wind down with in house massages and wholesome meals shared with new friends as the sun sets. Our women’s wellness retreat is all about doing what feels right for your mind, body and soul, so no matter which program you choose, how little or how much you do is always up to you. Whether you join us on a girl’s getaway or a solo journey, you’ll return home feeling totally refreshed and reconnected. We want to make sure you get the most out of your wellness retreat with Ocean Soul Retreat. Whether you can’t wait to jump into the waves or want to work deeper into your asanas, you can find the experience that’s perfect for you with our fitness programs for pilates, yoga and surf, combined with holistic therapies. Our women’s wellness retreat is all about doing what feels right for your mind, body and soul, so no matter which program you choose, how little or how much you do is always up to you. We limit each retreat to 12 women to ensure a transformative and fulfilling experience for all. Feel free to contact us with specific requests and concerns to further personalize your fitness holiday retreat. We believe in the power of the mind, body & soul connection. We believe that food is the best medicine. We believe in the importance of listening to your body. We believe in the benefits of body movement. Copyright © Ocean Soul Retreat 2015.